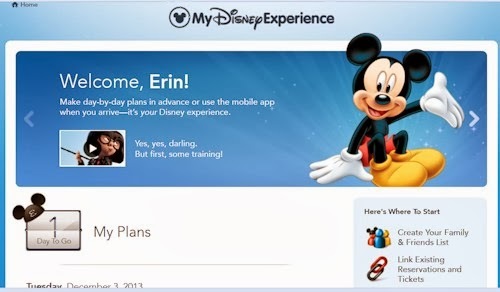 I'll be using my mobile webcam while we're in Disney World! I hope you enjoy it! If the webcam freezes on your computer, there's nothing I can do. And please don't text or call while the webcam is running. It interrupts the signal.Thank you! A trip to Fort Wilderness always starts and finishes with a trip to the beach by loop 300 to see the castle. We just got back from that; oh, coming around the corner and that castle with its lighting... it's so cliche and cheesey but it takes my breath away. Today was checking-in (we had done it online, so it was quick) and putting Christmas decorations up. We got a lot of them done but have a few more that we plan to do tomorrow. So after dinner, we took them around on the golf cart to see some decorations. They were amazed at the place which always gives me a good feeling. We got a Magic Band invitation, so we're using My Disney Experience even more. That's cool, because I love gadgets and I love using this site. Now we have more options. This part is the same. I love the mouse ears with my initial with the countown calendar. The graphics are fun for each option. 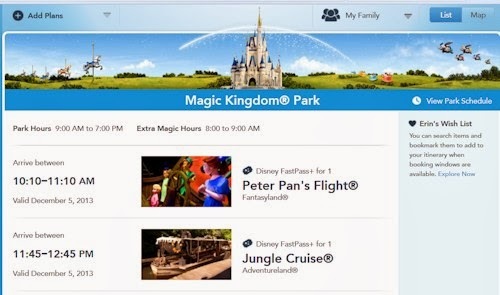 Here's an example of showing a park for that day in our itinerary with a couple of our FastPass+ selections. Another great option with FastPass+ is being able to make reservations for Be Our Guest; we even picked what we wanted to eat so we don't have to wait in line to order. 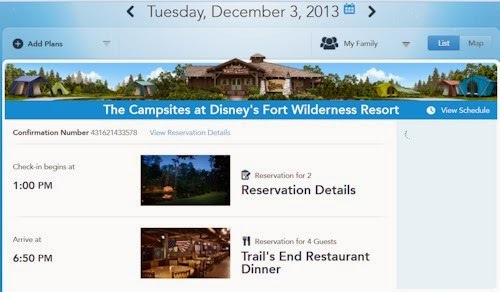 If we wanted to, we could change our order at any time through the beourguestlunch.disney.com web site. They're having a problem with these rezzies showing up on MDE, but they're working on it. I haven't been able to figure out how to reserve a place at a parade or Fantasmic. This shows our check-in tomorrow and our dinner reservation. The site is a lot of fun and the app to go with it is free and gives us all this information. Of course, it gives wait times and all the other information.